California is viewed by many as the state where things happen first. Some attribute its free-thinking mindset to the imagination-provoking jagged coastline that runs more than 800 miles and encompasses a rainbow of terrain and temperament. 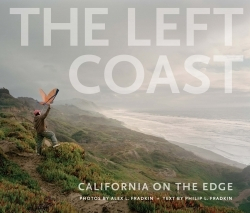 The author refers to this serpentine-like beacon of culture as “the left coast,” describing it as “someone or something that is different, strange, a bit noir, or liberal.” Both the author and his son, Alex, a skilled photographer, know this terrain well. When the elder Fradkin, a denizen since 1960, first explored the coast for his 1974 book California: The Golden Coast, assisted by his young son, he measured the pulse of a state that was already impossible to pigeonhole. Retracing their steps almost thirty-eight years later, they assign California eight “coasts,” ranging from the northernmost “wild coast” to the lightning rod “political coast” in the south. The author wields a pen, memories of the past, and keen interviewing skills, while the artist presents breathtaking color photographs that capture the coast’s magic. Fradkin senior seamlessly weaves together a meaningful tapestry of the history of these regions, the effect of the rugged coastline that so influenced the development of its communities, and the abundance—and scarcity—of natural resources. He takes the reader on a slow freighter ride as the pilot and captain maneuver carefully into the Port of Los Angeles, one of the busiest in the world. During his sojourn to the Monterey Peninsula he tells us about marine biologist Ed Ricketts, the real-life “Doc” Ricketts of Cannery Row fame—and John Steinbeck’s neighbor. Ricketts, a forward-thinking ecologist armed with statistics, knew firsthand the delicate balance needed to preserve and harvest the coast’s natural resources. Each chapter introduces the reader to then-and-now perspectives of a coastal region. The author quotes the 1909 and 2006 versions of The United States Coast Pilot, a nautical reference guide for ships’ pilots. He includes comments from 1939’s WPA Guide to California and historical figures, such as Richard Henry Dana Jr., quoted from his 1835 writings. Visitors to the Golden State could easily skip conventional guidebooks and keep The Left Coast handy for a thorough and engaging tour.